Shorty Robbins took her love of history to the next level by building a tiny home inspired by the Victorian era. Have you ever wondered what it was like to live in another century? For Florida resident and lifelong historian Shorty Robbins, 59, this question became a mission. 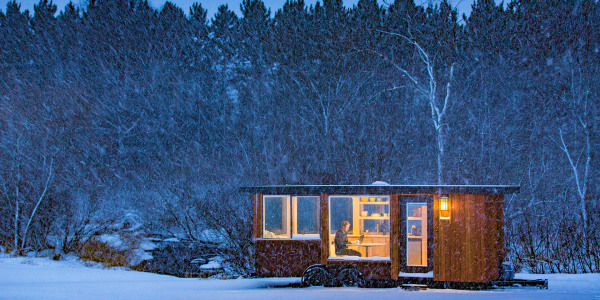 She built her Victorian-era tiny home as a way to connect with the past. But it also happens to be the perfect companion prop for her favorite hobby: participating in Civil War battle re-enactments, which she's been doing for nearly 20 years. Before she built the miniature house, Robbins would spend hours meticulously building her family's campsite for re-enactment events like Florida's Brooksville Raid and the Battle of Olustee, which both occurred in 1864. “You’d set up your whole homestead — carpets, furniture, dishes, an outdoor kitchen — I even used to haul a brass bed with me in my big tent,” she told TODAY Home. Luckily, Robbins' daughter-in-law was there to show her another option with a photo of a tiny house on her cell phone. “It was cute, it was perfect, it was amazing and it’s on wheels,” Robbins said. Two years later, she returned to the re-enactment scene with her Victorian tiny home — built almost entirely by hand — which she named Nawaka, after the camp she attended as a child. “Now when it rains, they all come to my house and we stay dry!” she said. Robbins began the process by working with a trailer builder on her custom RV design. From there, she taught herself how to install the plumbing and structural inflated panels. As a history lover, she found creative ways to include beloved family heirlooms and antiques into her 125-square-foot space, as chronicled on her Facebook page. One sentimental item she hoped to include was the piano she's had for 30 years. “In the proper Victorian parlor, you always had a piano — that was a status symbol — it was usually small and it would turn into a bed,” she noted. Robbins altered hers to fold out into a full-size bed and adorned it with a handmade quilt from her 81-year-old mother. She repurposed her grandparents’ dresser by turning it into a staircase to get up to the loft. “I’ve been able to integrate family treasures and memories into my tiny house, and it’s so much more meaningful and worthwhile to me,” Robbins said. She also installed a water pump on her front porch for cooking; a tool that was used in some New England households by the end of the 19th century, the Massachusetts native explained. “The water pump was the latest in modern technology,” she said. “You wouldn’t have running water in your home typically in the Victorian period.” Robbins completed the build by installing a working potbelly stove in her kitchen — perfect for making a cup of tea! She sought to incorporate as much repurposed material as possible, including church windows she received from a friend and reclaimed tongue-and-groove oak flooring from an old general store. This story was originally published on Nov. 3, 2017 on TODAY.com.